"Change is a constant for me. 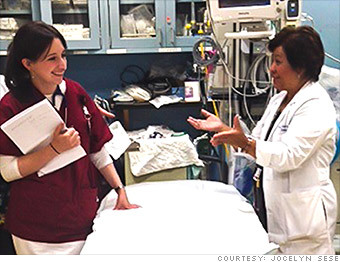 I love the thrill of discovery," says Jocelyn Sese (right), a CNS at Maimonides Medical Center in Brooklyn, N.Y. "Even after all these years of nursing, there are still new things to learn and introduce to the staff." What they do all day? With Obamacare raising the pressure to control health costs, it's no surprise this is a hot healthcare career. These change agents use their clinical expertise and organizational influence to develop policies designed to improve patient outcomes and deliver health care more efficiently. How to get the job? The best specialists are a combination of nurse, leader, educator and researcher. A big part of the role involves teaching and motivating others to adopt new practices and innovations. Graduate-level training in a nursing specialty is a must. Do Clinical Nurse Specialists have great jobs, or what? Are these great jobs, or what?